After my first class today I sat down in the student commons on the couch. There was a guy on the next couch over sitting almost fetal-ly, sleeping. It's western suburban winter at Aurora university. A school that in all respects is expanding beyond its capacity. Many of my classes are over crowded, it takes anywhere from 10 -25 minutes to find a parking spot, and the lunch line moves at a snail pace, and even if you are able to fill a plate you may have to wait 5 to 10 minutes to find a seat. Today, after hurdling these I confronted the most frustrating of them. Finding a quiet place to read and work on homework. Like addressing the parking problem, I am forced to hover around and wait for someone to get up so that I can slide in to their seat. Today, as Lacan would say, I was witness to an intervention of the real. Diagonal from where I was sitting, two individual stood and shouted. Above them the ceiling began jettisoning water from the lightening fixtures. Lacan’s tuché [i.e. the irruption of the real into reality] is in one sense very simple: it is a tile falling on to the head of a passer-by, a person from Porlock bringing a creative trance prematurely to its end, or, to take one of Lacan’s own examples, a knock on the door that interrupts a dream" (Bowie 103). In these examples we can see how the real is never directly present to our experience, but rather makes itself felt in its contingent effects. Thus, the "tile falling on the head of a passer-by" is not a direct intervention of the real, but an event through which the real makes itself felt in its sheer contingency, its materiality, and its disruption of the order imposed on the raw material of the world by the symbolic acts of humans. The deviation from the ordering of the world (i.e. by putting up tile roofs to ward off the vagaries of the weather) captured in the falling tile thus serves two purposes in manifesting the effects of the real: first, it demonstrates the persistent element of contingency and outright danger that lurks in the failure of these ordering practices to be exhaustive and comprehensive (i.e. to take into account all possible eventualities); second, it manifests to the passer-by in a very immediate way the real of his own mortality – it insists on the contingency of human life, however well ordered it may appear (Source). Moments later, laughter echos out and a crowd to gawk at the new electrically charged waterfall flowing from the ceiling. The two women who replaced the sleeping man next to me were laughing. I turned to them and said, "You laugh now but it could happen to us!" I gestured towards the ceiling above us. "Are you serious?" They echoed. I collected my things and prepared to go outside and cross the quad to find some where else to sit and read. With my coat now on I turned to see that the laughing crowd was now wielding phones and taking photos and videos. And more were following in tow. At this point the fire alarm was going off and the crowd was growing and the cameras were recording. The scene reminded me of the cover of Guy Deboard's famous text Society of the Spectacle. 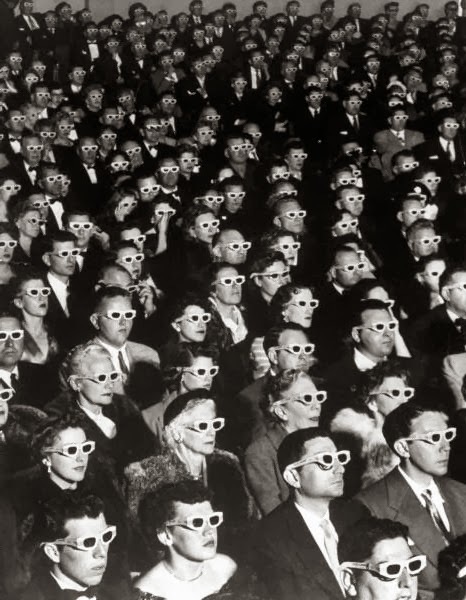 On the cover is a black and white photo of an audience wearing glasses looking towards the screen. Why is our common sense reaction to trauma to mediate the experience with a screen? Why is our first reaction not to do something that matters? Why did no one call for help before filming? Distancing myself from the leaky ceiling. I headed out on a quest to find some other sacred quite place to read (as did a mob of others). Luckily, I'm quick like a bunny and was able to find an open spot in an adjacent building. After reading for some time, I ran into one of the other leader of a club I'm working with and we strategized a game plan moving forward into our next club meeting. As our conversation passed other people she seemed to know filled the seats across from us. Suddenly, I was sitting in the middle of a meeting and so I began reading Commonweath. Below, I'll switch between quote and points in their meeting that provoked me in to WTF mode. We understand the metropolis instead as the inorganic body...the metropolis primarily generates rent... Workers produce through out the metropolis, in it's every crack and crevice... the common and unforeseen encounters are mutually necessary (p. 249-254). I began noticing that the meeting was dominated by one voice, as if he was a task masker giving out lists of things to do, and this meeting was about hearing reports. The politics of the metropolis is the organization of encounters. Its tasks is to promote joyful encounters, make them repeat, and minimize infelicitous encounters. This requires, first, an openness to alterity and the capacity to form relationships with others, to generate joyful encounters and thus create social bodies with ever greater capacities. Second, and perhaps more important, it requires learning how to withdraw from conflictive, destructive relationships and to decompose the pernicious social bodies that result from them. Finally since so many of the spontaneous encounters are not immediately joyful, this politics of the metropolis requires discovering how to transform conflict encounters, as much as possible, into joyful and productive ones (p. 255). At this point tension arose between the task master and my club co-conspirator where after he had reprimanded her about not moving forward on some idea with out approval, then minutes later asked her why she didn't move forward, to which she reminded him about the previous conversation. To this I chuckled. "Obama should be crucified! I work with people that obamacare is screwing over, this guy lost 200 and so on and so forth," shouts the taskmaster. I'm not entirely sure what provoked the outburst. Nobody seemed to be talking about health care. The third task for the politics of the multitude in the metropolis, then, which must in most case, in fact, come before promoting the production of the common and joyful encounters, is to organize antagonisms agains the hierarchies and division of the metropolis, funnel the hatred and rage against its violence. There is joy also in destruction - attacking what you hate, the source of your suffering (P. 260)! Thinking back to bizarre dialog that transpired during this meeting it felt surreal. Almost as if the dialog was purposely structured to be disengaging and push people away. Eventually, 6pm happened. As the teacher began to set up class, and caught me yawning, and said to me "Don't even start!"